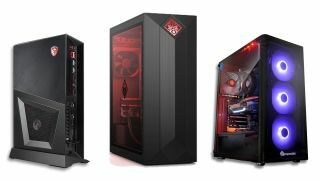 Prebuilt gaming PC manufacturers have really been stepping up their game since the dawn of the RTX era, and sorting out which is producing the best gaming PC can be somewhat of a challenge. While any of these builders can theoretically stuff a bunch of blazing fast performance parts into a case and come away with a mighty gaming rig, the devil, as they say, is in the details. You need to pair that performance with excellent heat management, for instance, intelligent sinking and ventilation that doesn't cause your fans to kick out noise at the level of a V2 rocket launch. Price is king, of course, you really want to avoid paying too much of a premium versus the cost of building a machine yourself, but there are other critical features too, like cable management, inclusion of quality proprietary parts, and warranty. To sort out how we figure out which machines make the cut, check out our gaming PC testing guide. What should you be looking for when you start shopping for the best gaming PC? Obviously, the best graphics card should be top of mind, and that can mean different things for different people. Gamers obviously will need something at least relatively capable to handle the best PC games, but there are additional considerations, like whether or not you're sold on Nvidia's predicted ray tracing future. If you are, you'll like want to invest in one of their RTX cards (while ray tracing support is coming to GTX Pascal architecture, it'll never match the performance derived from the RTX line's dedicated ray tracing cores). However, if ray tracing isn't a priority, you can save yourself some cash and invest in a machine built around a GTX or one of AMD's card. Given how increasingly important main processing is for games, you'll also want to avoid bottlenecks with one of models from our best CPU for PC gaming roundup. You'll want something in the Core i5 range as a baseline, but if you plan on doing any significant amount of productivity work on your machine you should really opt for a higher end CPU, something in the Core i7-8700 to Core i9-9900K range. When it comes to pre-built PCs you need to find a reputable brand that will fill your new gaming rig with the best parts, in the best configurations. For us, HP's Omen range are the best gaming PCs, not because they offer incredible power, or because they're the cheapest, but because they balance everything you need from a gaming PC. Let's start with the chassis - the Obelisk is a mid-tower case, with a lovely glass panel on the side for displaying all your innards. It has tasteful lighting inside, but nothing too excessive. There is sufficient cooling for even the highest end builds, and the case isn't too massive either. It's a nice balance. Inside, we recommend the spec with the 2080 graphics card, if you want to keep this gaming PC for the long-term. The top end of Nvidia's new Turing cards all handle ray tracing, which is very much the future of visuals in games, and while the 2080 is super expensive (probably about 40% of the cost of this whole PC), they will last. The supporting specs perfectly compliment the card - an i7-8700 6 core CPU, 16GB of 2666 RAM, and a dual storage solution with a 256GB SSD and a 2TB HDD. Ok, in a perfect world, you'd have a 500GB SSD, but this is still more than enough to make Windows booting quick and easy. There's tool-less access to the case, so you can dive in there and swap out parts if you feel like some quicker RAM or a bigger SSD. In all, it's an impressive machine, and one that's flexible enough for easy upgrades if you need. There are few frills - custom RGB lighting aside - which is why the price is so reasonable, for a 2080 build. Thoroughly recommended. If money is no object, then the Corsair One series is our pick of all gaming PCs. While the i140 is more than capable of handling games at 4K, we prefer the i160 for sheer power and gaming prowess. What's truly remarkable about the Corsair One PC line is that they pack in such power components into such a small, custom-built case, and still allow everything to run quiet and cool. The case itself has holes on each side, and fans under the unit to allow adequate airflow, along with several other cooling systems inside. As a result, the machine is whisper quiet and small enough to fit into a typical living room set-up without hogging too much space. Inside, everything is thoughtfully built. There's a quick i9-9900K CPU, meaning the One is perfect for multitasking, so can handle video editing and art tools extremely well, along with gaming. The 2080 Ti GPU inside is top of the range, and will smash any game at 4K, while the 32GB of RAM keeps the whole system held together rather nicely. There's a big enough SSD / HDD combo (480GB SSD / 2TB HDD) to ensure you have plenty of storage for games, although, again we'd expect a slightly larger SSD for the money. You can swap components into the One, but that will invalidate the warranty, so you'd need to be confident about doing so. It's easy enough to do. As small form-factor gaming PCs go, this is a monster, and thoroughly recommended for gaming. If you want to shave a few £s off your budget, the i140 is a great performer too, but given that you'd expect this PC to last you for years, we'd definitely pick the slightly higher-spec machine. If money really is tight, you should consider the MSI Trident 3 range of gaming PCs. While the innards won't win any awards, they're reliable pieces of kit that are well put together and often found at £700+ prices, which is really good for a gaming-ready PC. They come with smartly designed cases, and decent cooling tech to prevent your components from overheating if you stress them and boost the CPU clock to 3.5Ghz. The 1050 Ti graphics card is the weakest link here, and while you'll run most games at 1080p, you'll likely struggle to reach decent fps with top titles, and won't be able to achieve ultra settings in many cases. Does that matter to you? After all a machine like this is perfect for Fortnite and will run Apex Legends with few problems. It comes with a decent-sized 1TB HDD, and 8GB of DDR4 RAM, which is plenty for most games. The i5 processor is actually a decent one for a build of this price. You also sacrifice things like glass side-panels on the case, and RGB lighting, but you can easily open up the Trident to add new components if you feel up to it. What's more, the Trident is quite portable, and it will operate stood up, or lying on its side, if space is a concern. It's not a powerhouse, but is a competent gaming PC for a super reasonable price. Just don't pay more than £700 for it. While Intel is the biggest and best name in CPUs, AMD - its main rival - has several comparable chipsets which perform equally well, and come much cheaper. So, we've included an AMD build here, to help you save a bit of cash on a great spec gaming machine. If you're looking to use your PC primarily for gaming, with maybe a little work and other media usage, you'll be more than fine with an AMD processor powering everything. Elsewhere inside this PC Specialist build you get a lot of powerful components for your money. Whereas the RTX 2070 graphics card is neither the most powerful, nor the cheapest of the new ray tracing GPUs, it does offer great performance for games, while keeping the overall price of the unit down. It's complimented here by 16GB of DDR4 RAM and a standard 256GB SSD / 1TB HDD combo. For the price, that seems about right to us. PC Specialist uses decent components too, so you won't be sold the cheapest parts in these machines. This gaming PC will easily handle the best games at 1080p, and bring decent frame-rates to most (60fps+ in most cases). Well recommended for pure gaming. Normally, this is the point where we recommend another couple of pre-built PCs and end the article. However, that's no fun, and quite frankly we've got a better alternative for you. Over at UK-based site, PC Specialist, you can create your own PC from a series of easy to understand options, which guide you through the process if you're curious about it all, but don't have the confidence to literally build your own gaming PC from scratch. We'd recommend experimenting with some parts, like storage and cases, based on your own needs and budget but we've listed a couple of suggested builds below, based on our expertise. The top one is a budget gaming PC, that will get you the best spec for less than £1000. The lower one is a high-spec gaming machine that we'd use ourselves, with sensible (but not excessive) components inside. Take a look with confidence - the website will actually warn you if certain components are incompatible. Select your gaming PC from the Intel Z370-Z390 menu. Select your gaming PC from the Core i7/i9 Extreme computers menu. 11GB NVIDIA GEFORCE RTX 2080 Ti - HDMI, 3x DP GeForce - RTX VR Ready!